3 Bedroom End of Terrace House For Sale in Chesterfield for Guide Price £130,000. FEATURED IN THE BIG OPEN HOUSE EVENT 27TH AND 28TH APRIL - please call the branch for viewing arrangements. 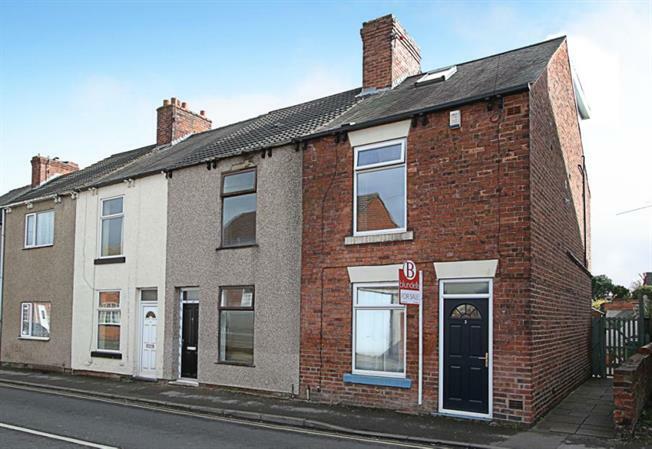 An attractive three bedroom end of terrace property in the popular residential area of Hasland. Deceptively spacious accommodation on three levels which must be viewed to be fully appreciated. The property briefly comprises of: The entrance door leads into the attractive lounge with a feature fireplace. The modern kitchen/dining room benefits from a range of wall and base units and provides access to the rear garden. Stairs lead to the first floor landing which provides access to two of the bedrooms and family bathroom with w.c, wash hand basin and bath. To the second floor is the well proportioned attic bedroom with en-suite comprising of low flush w.c, wash hand basin and shower. To the rear of the property the garden is partly laid to lawn with a paved seating area. Hasland is a small town close to Chesterfield which features a wealth of amenities including; shops, schools, doctors and the ever popular Eastwood Park. Hasland also has its very own theatre with regular productions throughout the year and any budding thespians are welcome to join! . Excellent commuter routes via A617 to Junction 29 of the M1 motorway network along & within easy reach of Chesterfield railway station providing easy access to Sheffield, Derby & Nottingham.